Being a taxi driver these days is hard work. Besides dealing with verbally abusive passengers who expect you to know every nook and cranny of Singapore, you are also vulnerable to being bullied and physically assaulted. And let's not forget the fare evaders. Last Thursday evening (Oct 11), Stomper Taxi Uncle picked up a passenger at The Inflora, a condominium located along Flora Drive, and dropped her off at White Sands MRT Station. The woman was alone and her fare amounted to $9.54. Taxi Uncle said: "The passenger wanted to pay by credit card but my taxi did not have the machine. She said she had no cash and wanted to withdraw cash from an ATM. "However, there were many cabs at the taxi stand when I dropped her off as well as an Land Transport Authority (LTA) warden there, so I was unable to wait. "I told her that I would pass her my contact number by giving her a missed call and text her my bank details so that she can transfer the fare to me." However, it has been over a week and Taxi Uncle said he has yet to receive the money. 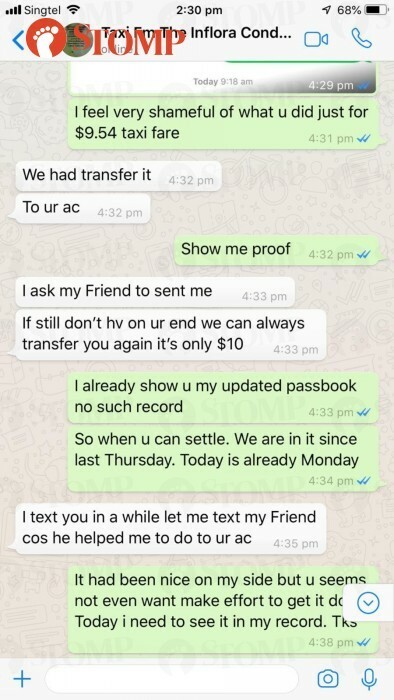 Thursday: Woman said she would transfer the money "later"
Saturday: Woman said she was "busy"
Monday: Woman said "it's just $10" and told cabby he was "thinking too much"
She later told Taxi Uncle in the afternoon that she had transferred the money to him. However, the Stomper said that he did not receive any payment at all. The woman subsequently said on Tuesday (Oct 16) that the money had been wrongly transferred to another account, adding that she would make another transfer to Taxi Uncle. 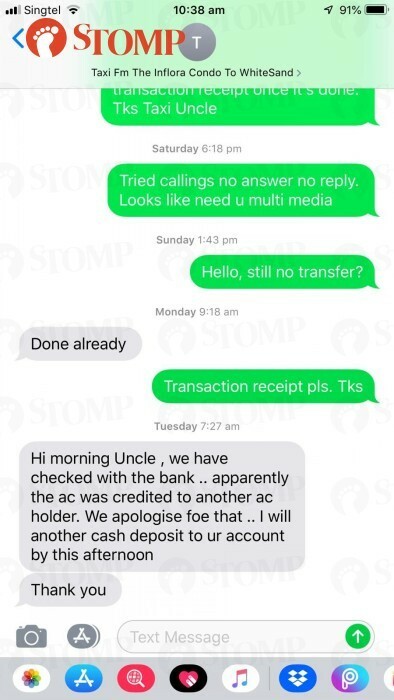 Taxi Uncle told Stomp on Friday (Oct 19): "I last heard from her via WhatsApp on Monday and via SMS on Tuesday. "I tried calling her but there was no answer and no reply. 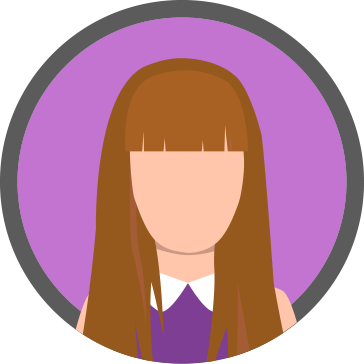 "To date, there has been no payment and no further updates from her. 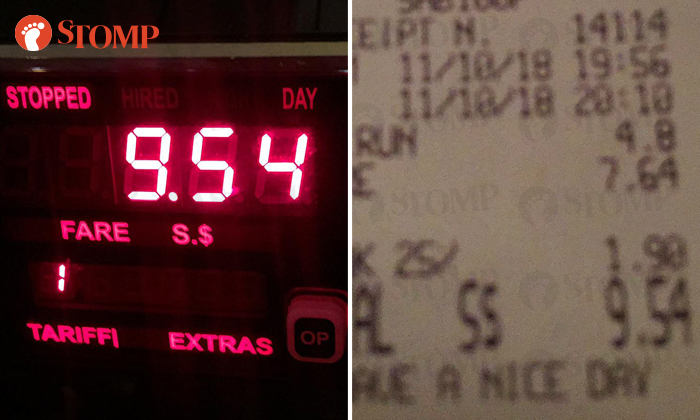 "We as cabbies want to provide good service and do our best to help out, but I hope our kind offer won’t be misused by ill-hearted people around. "Let’s be good and let us all have a more liveable society." See the full conversation in the gallery.